(CBS News) Have you ever been out at a party or taking it easy at home and you want to pop open a bottle of wine, but can't find a corkscrew anywhere? Normally you'd just have to shatter the bottle and hope that there's no glass in your wine (just kidding! 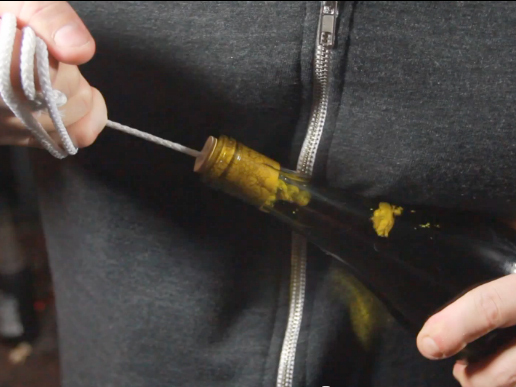 ), but you're about to have seven handy-dandy tricks that work in place of a corkscrew after you watch the video above. Wine. The nectar of the gods. But what if your corkscrew mysteriously goes missing? We've got some simple ways to solve that problem so that you can get your drink on. 1. Hit up your junk drawer and grab a screw hook. Apply it to the cork and get it snug. Now carefully and slowly wiggle out that cork and enjoy the fruit of your labor. 2. Hit that junk drawer again. Find a thick screw and twist it down into the wine stopper. When you are done grab pliers or clippers and twist that bad boy out. Voila. 3. This also can work with a large nail but you need to pound it in at a slight angle and then carefully remove the nail and cork with the back of a hammer. Take your time and you'll be fine. 5. The shoe string method. Want to really impress? Bore a hole in the cork and tye a big knot in a string. Shove that thing down there and then simply pull up hard on the rest of the string. Plipitty ploppy, time to get sloppy. 7. Finally, just to keep things fresh I will show you a new method that while not the easiest. Has some fun results. Grab a bike pump and shove the tube down a hole you bore in the cork. Give it some pressure and watch the cork rise. Once it is about halfway pull it with your hand and set it free. A triple-rainbow salute of "cheers" goes out to Household Hacker from us at The Feed for another excellent "life hack" video to keep the wine flowing. And if you'd like to check out more great work from Household Hacker, you can see our previous posts here or go to his YouTube page here.